Hello everybody and welcome to episode 4 of Cafe Hopping with Eros & Fufy! Fufy and I actually have a list of places we want to visit and this month we decided to go to DCOVA Cafe! I've heard good stuff about this place and some reviews online actually said that this was a very nice cafe. I've passed by it a few times and thought that the whole building would be the cafe (read: it's not). The cafe is quaint and Fufy told me that since it's popular it's really hard to get a table on the weekends, so we decided to go on a weekday instead. I did find the coffee related quotes a nice touch though. The counter is on the far back of the cafe and like usual cafes they offer coffee, cakes and food such as pasta and rice. 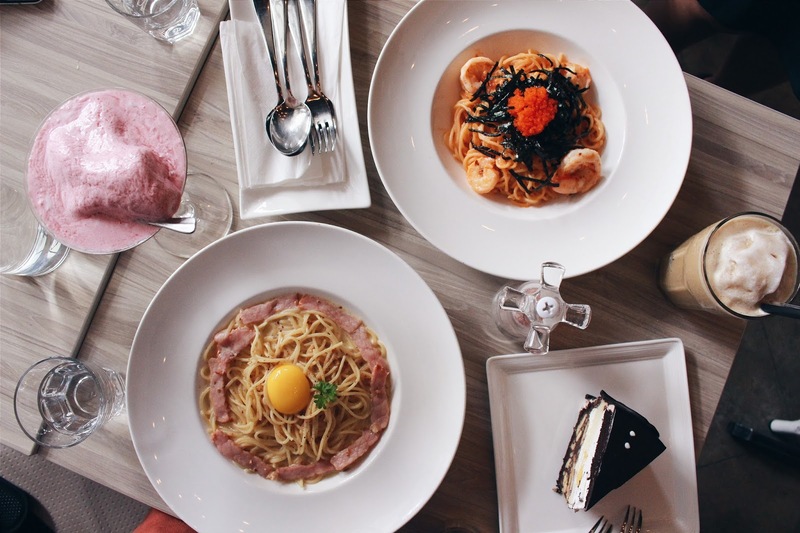 One of the specialties that caught my eye was their Squid Ink pasta/rice, but at the time I was too hungry (it was 2pm) and I wasn't feeling very experimenty~ when we revisit this cafe someday I shall try it. I ordered this because I'm a fan of sweet things and since it was a hot day, I wanted something refreshing. This drink is actually a mix of yogurt and ice cream so during the meal it melted quite a bit. I wouldn't say that I liked this purely because it was basically just ice cream/yogurt and it left me with that sticky feeling in my mouth when I wanted to be refreshed instead (am I making sense lol). I rate this a 2.5/5. As a carbonara fan, I decided to order their signature carbonara. I would say that the portion was okay, but since I was very hungry at the time I was left a bit...unsatisfied. The taste however was okay. There was enough sauce for the pasta that it wasn't dry, there was a generous amount of bacon and the pasta was cooked just right. I rate this a 3.5/5! Fufy ordered this as her drink and when I tried it I regretted ordering my Summer Strawberry. The ice blended coffee was sweet, cold and totally my style. Sigh. The taste of coffee wasn't very strong but I believe it would be enough to satisfy a craving for coffee. As for Fufy, she said she enjoyed it but wouldn't recommend it because she thought it would be better served hot. I give this a 3.8/5! Fufy's choice of pasta was this dish and it was alright. It wasn't spicy even though the colour would suggest that it is (at least for me). As for Fufy, she said the pasta was something different from other pastas and that it was amazing! I guess it suited her tastes well. Our choice of cake to share was this cake and it was the perfect balance of chocolate, cake, cheese cake and that cracker thing at the bottom. I definitely enjoyed it, plus the slice is quite big! Overall I was satisfied with my meal. Not completely amazed or anything, but I guess that's because I've been having carbonara quite often. Mental note to self; try other food! 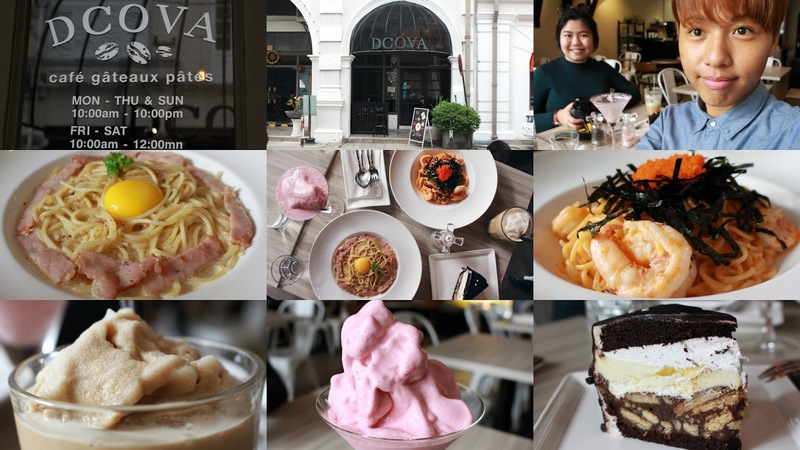 So that's all for my review of DCOVA Cafe! I recently made a banner for this cafe hopping series as well!